Over the Easter weekend of April 9th -12th 2004 there was a gathering of boats above Marple Top Lock to celebrate 30 years of the restoration of the Marple Locks and 30 years of the Cheshire Ring.The wooden narrow boat "Maria" was on hand after being horse-drawn from its Ashton base to celebrate being 150 year old! In readiness for this anniversary, Maria was restored to its original condition, with the removal of the roof that was added when the boat was converted for carrying passengers. Maria was built at Jinks' yard, next to Marple Top Lock in 1854. At 12 noon on Good Friday, 9th April, a locally-made cast iron signpost was unveiled by Andrew Stunnell MP to commemorate the work of Ted Keaveney, a local canal enthusiast, who was instrumental in getting the 16-lock flight reopened in 1974. Also in attendance were representatives of the Inland Waterways Association and Macclesfield Canal Society plus members of the Keaveney family. 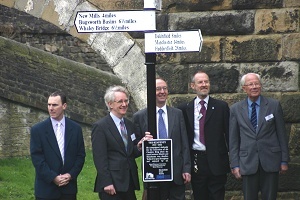 The signpost was funded by contributions from The Inland Waterways Association North West Region, The Macclesfield Canal Society and British Waterways. 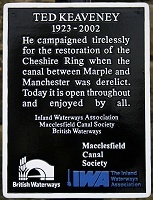 It was erected by the IWA volunteer 'navvies' - the Waterway Recovery Group - assisted by members of the Macclesfield Canal Society.